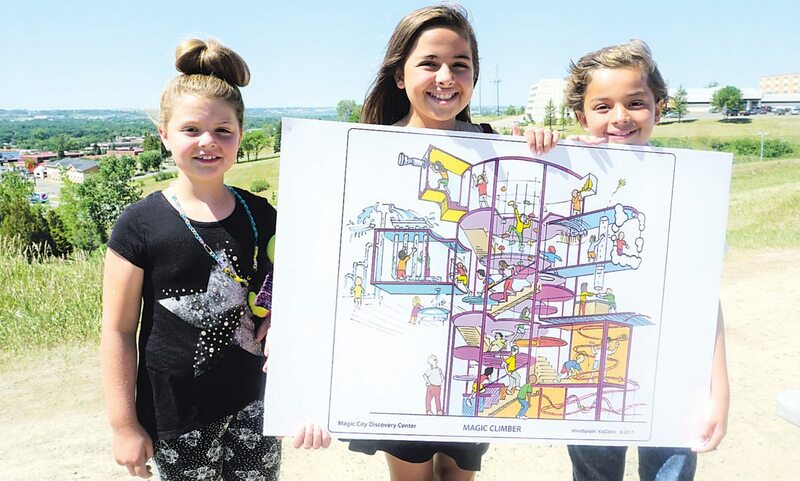 Jill Schramm/MDN Sydney Lyman and Sholeh and Shayan Mozaffari hold an architect’s rendering of an interactive exhibit proposed for a new Minot Discovery Center at a news conference Thursday. A location has been selected and fundraising is about to begin for a future, permanent children’s museum in Minot. 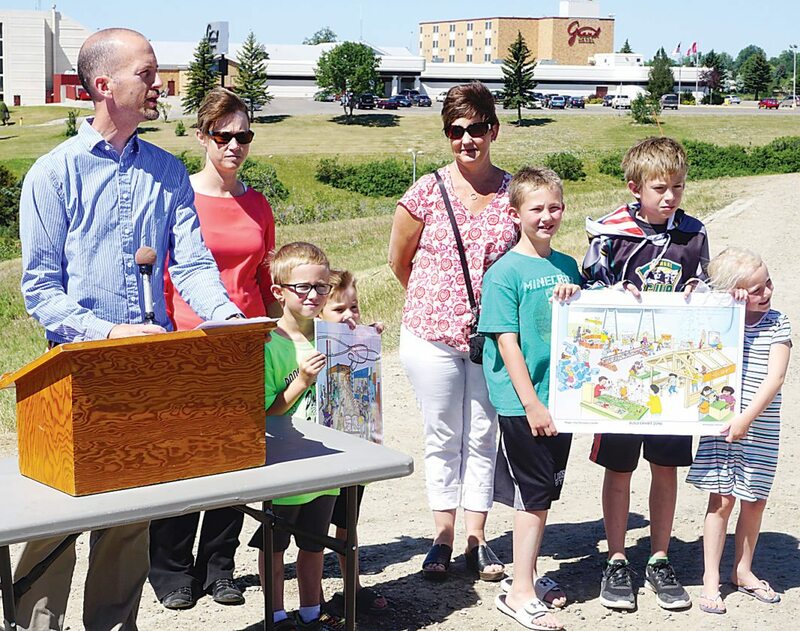 The Children’s Museum Board in Minot held a news conference Thursday in north Minot at the site of its proposed Magic City Discovery Center. The property, just southwest of the Sertoma softball fields on the south side of the airport, would be leased for $1 a year from the Minot Park District for 50 years – an arrangement similar to one that exists between the district and the Scandinavian Heritage Park. The location is a short distance from Broadway, on a hilltop offering panoramic view of Minot. The Discovery Center has been operating in a temporary location at the Dakota Territory Air Museum for the past three years. It will open there again in November for another five-month run. Visitor numbers have increased about 150 percent each year, board member Wendy Keller said. Last year saw about 7,500 visitors. Jill Schramm/MDN Mark Lyman, left, spokesman for the Minot Children’s Museum, announces plans for a new museum center on the proposed site in north Minot while joined by other board members and supporters. “It’s always been the dream of this board and this community to build a stand-alone museum,” Lyman said. The board has been researching options for the past two years, considering more than 20 potential locations for renovation or new construction. The board is considering a three-story, 20,000 square foot building with large glass windows and six to 10 science, technology, engineering and math stations. It has been working with renowned children’s museum consultants MindSplash and KidZibits. The board believes the museum has potential to attract 75,000 to 100,000 visitors within a few years of opening. The museum is projected to have an direct and indirect economic impact of $2 million, employing four to six full-time people and 15 part-time employees and generating $200,000 in state and local tax revenue. The Children’s Museum is requesting a $2.5 million grant from the Minot Community Facilities Fund. The Community Development Committee meets July 20 to determine how to allocate about $4.8 million available from sales tax collections in the fund. The museum board also will be initiating a capital campaign later this summer with a goal to break ground on a new museum in the next year to 18 months. The potential opening date is in three years. The campaign likely will seek $8 million to $10 million, but the project is in an early phase with no finished architectural plan or project cost yet.